The planned spending in 2018 was $10.6 million, but this is revised to $19.5m showing the change in the year just completed. New spending of $17.3m and $49.0m are proposed for 2019 and 2020. There is an offsetting entry elsewhere in the budget reducing the 2020 approval to only $2m. 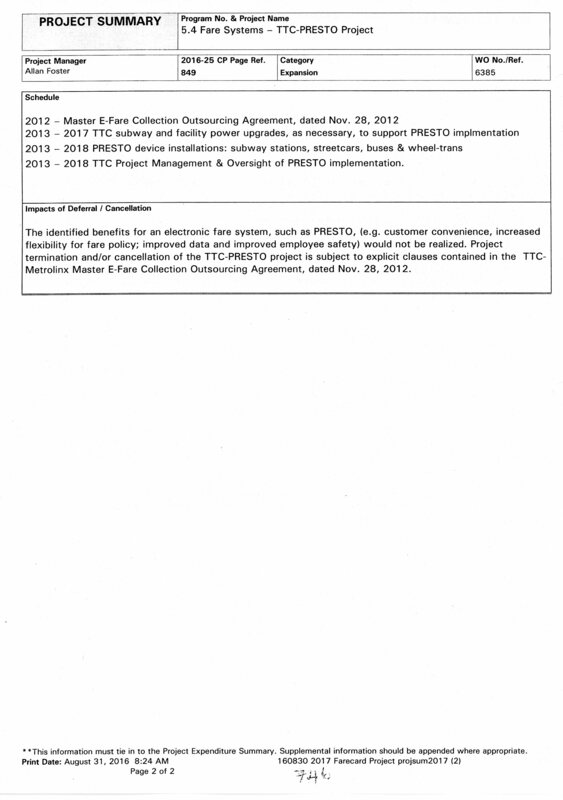 This is a very large change in the scope of the project and shows the degree to which features that should have been included in the base Presto functionality are missing either because the TTC didn’t ask for them, or because Metrolinx intends to charge for their implementation. This will be of interest to the Auditor General’s review of the Presto contract now underway. I hope you mean $43 million spent through end of 2017, not $43 billion. Steve: Ooops, yes. Even Presto could not burn through that much! I notice at the bottom of the last pdf the note “FINITE” and an end date of 2020. Of course, we know that the City & TTC will simply move the date forward as necessary! One has to wonder: Which is worse? Their not having an answer because they know something, or not answering because they haven’t a clue. $43 Billion – should be million, yes? And the extra funds must be for the newly required fare enforcers? Steve: Yes, million as Normal Wilson pointed out in another comment. Fixed with thanks to both of you. The fare enforcement is a staff cost which is in the Operating Budget, not Capital. If it was not for Steve, we would never know that the TTC wasted 43 BILLION dollars on Presto already with more waste to come. Thanks Steve for letting us know. This is why the province needs to take over the TTC. Steve: The “Billion” was a typo that has been fixed. It is “Million”. And don’t forget that Presto is a provincial project that has cost us hundreds of millions already. 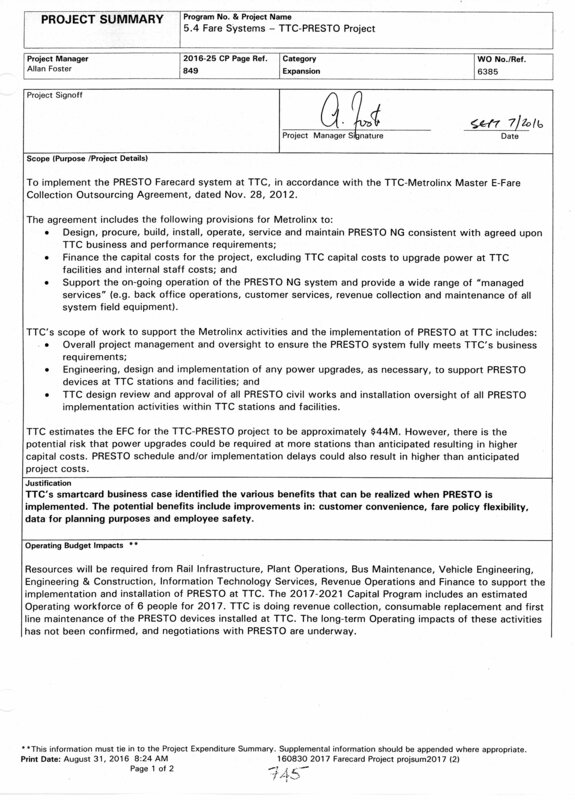 There’s a lot of text in the years-old TTC/Metrolinx agreement about operators being able to give people Presto-enabled transfers. How then is there any new costs related to this? Steve: That is precisely my point. TTC seems to get dinged for the cost of implementing things that are already in their contract, in part because they won’t publicly shame Metrolinx for non-performance. What is your take on the Trudeau budget? There is no money for the Downtown Relief Line, there is no money for the Waterfront East LRT, there is no money for the Waterfront West LRT, there is no money for the 60 more streetcars that Toronto needs, there is no money for any of the much needed transit projects in the GTHA. I personally am very disappointed by the Trudeau budget. What do you think? Steve: The big ticket transit projects will be funded out of the Public Transit Infrastructure Fund, Phase II, which is already built into the budget from past announcements. Many projects’ update reports are coming to the next round of Toronto Executive and Council in April, and arising from this the City will sort out how it wants to use Toronto’s share of the money. 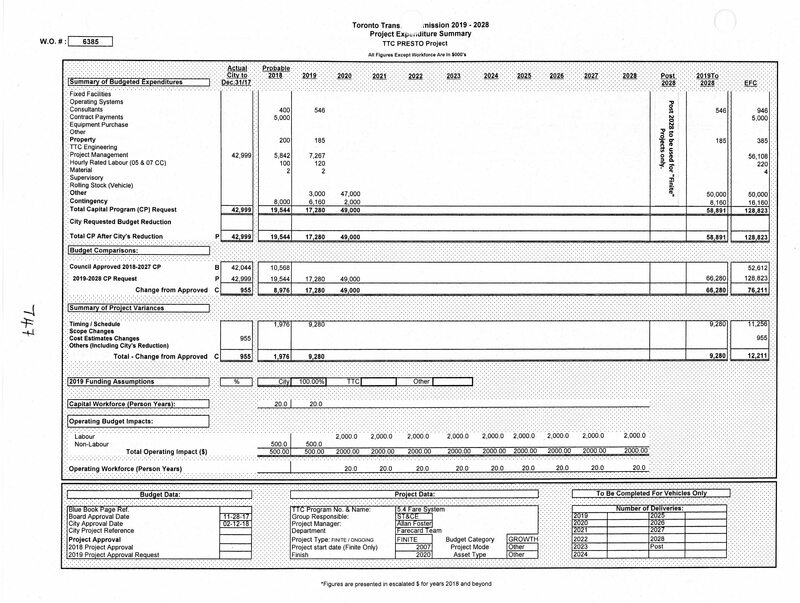 Even so, the amount of PTIF available is well below the total of all projects. Then there is teh small of problem of getting Queen’s Park to chip in the provincial share. In my random trips around the TTC in the past couple of days (paying with tokens from a found stash), I have seen several examples of on-vehicle Presto readers reading ‘Ready’, but not reading Presto cards — i.e. the person taps, repeatedly, but there is neither an Accepted or Rejected. Sometimes the person can tap in at the back door reader instead, sometimes not. The same Presto reader might read most cards, then not read another one or two — which are valid, because the person then taps on the other reader. I have doubts about the longevity of the $6 Presto cards. In my opinion, Presto should be providing them for free, which would give them an incentive to make them simple and reliable. Steve: Meanwhile, I have seen actual working (!!!) single ride vending machines successfully taking token and cash fares, and printing receipts, all without repeated attempts to make them take the coins, freezing up for riders or generally being cantankerous. Maybe it’s spring and they are in a good mood! Presto was foisted on Toronto by the previous provincial government, and I expect that the current occupant of Queen’s Park will simply foist any extra payments for Presto on Toronto. I have cracked quite a few in the past six or seven years. You don’t need even a full crack to stop them from working, even a hairline crack in a corner will bork it. It’s one of the reasons I simply won’t take it out of my briefcase anymore for streetcar rides, despite the loud sighs from fare inspectors who don’t like the fact I know I don’t have to tap on since I have a pass loaded. I’m not interested in paying $6 once again.